Discover the handsome styles of boys clothing from Old Navy for a variety of casual and dress essentials. Choose from a wide selection of durable boys clothing designs including casual, dress, activewear and outerwear options. Enjoy a popular array of boys clothing featuring such essentials as jeans, pants, shirts, tees, polos, hoodies, track pants, coats and sleepwear. 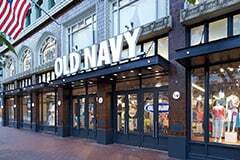 Add some affordable style to their wardrobe with the quality designs of boys clothing from Old Navy.